Hand picked by Jeremy Rogers this filly by Rubick – the most precocious son of champion sire and broodmare sires Encosta de Lago. 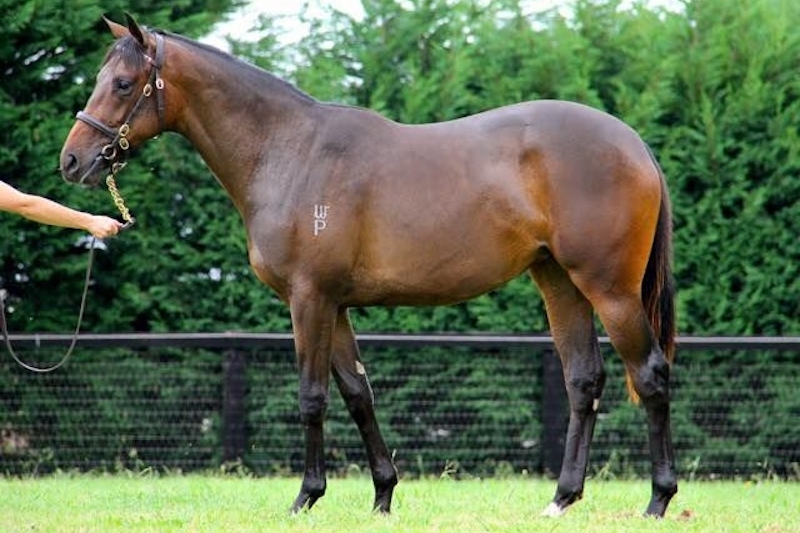 Out of Sliding Cube, a group winner over 1000m and 3/4 sister to Champion sire Redoute’s Choice. The dam side is just as impressive as she is out of a winning Fastnet Rock mare and is a really good size first foal. She is also closely related to La Passe and Social Spin. 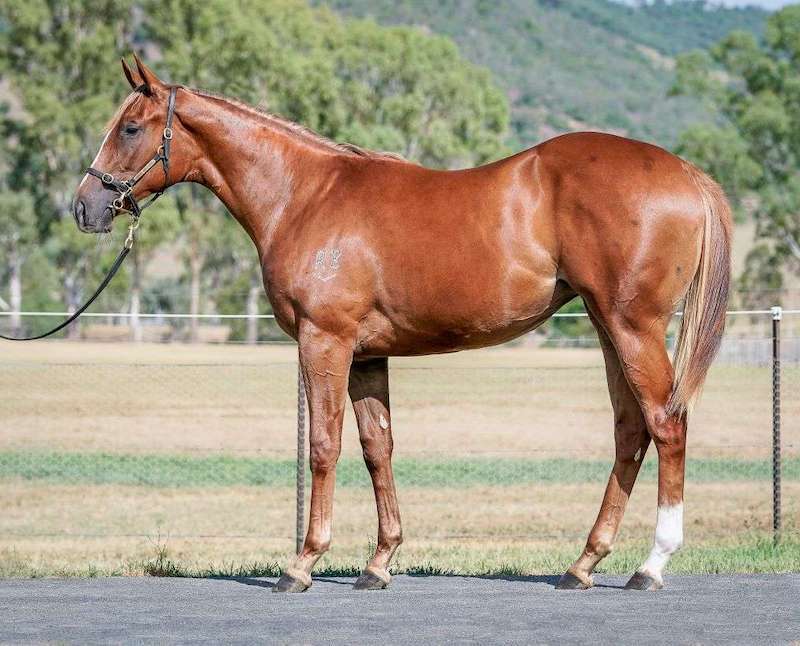 The mare has thrown plenty of Fastnet Rock into this filly and we expect her to make a lovely late 2YO and she will be thriving in her 3YO season up to a mile. RUBICK (AUS) (Bay 2011-Stud 2015). 3 wins-2 at 2-at 1000m, 1100m, A$379,500, MRC Schillaci S., Gr.2, Blue Diamond Prelude (c&g), Gr.3, ATC TAB Iphone App 2YO P., 3d ATC Challenge S., Gr.2, 4th MRC Blue Diamond S., Gr.1. Out of SW Sliding Cube (AJC San Domenico S., Gr.3), a three-quarter sister to SW Redoute’s Choice and SW Platinum Scissors, a half-sister to SW Manhattan Rain and SW Echoes of Heaven. Sire of SW Yes Yes Yes (ATC Todman S., Gr.2), SP Alburq, Biscara, Krameric and of Rubic Rose, Andrassy Avenue, Belitsa and of the placegetters Bright Rubick, Chia, Leshrac, Miraculous, etc. His oldest progeny are 2YOs. LA FEMME FATALE, by Fastnet Rock. Winner at 1400m in Aust. Three-quarter-sister to HYPURR - SICHUAN SUCCESS (H.K.). This is her first foal. Cash Strapped. 3 wins to 1250m, A$90,945, to 2018-19 in Aust. Star Cash. Winner at 1000m in 2018-19 in Aust. Bribe the Witness. Winner at 1200m in Aust. La Femme Fatale. Winner. See above. Tom Coureuse (Beautiful Crown). 7 wins-1 at 2-to 1350m, A$280,790, STC St John's Park Bowling Club H., BTC QRSE Woolworths H., STC Newk & Rosewall for Humpty 2YO H., 2d AJC Canonbury S., L, STC Decina Barthroomware H., BTC Play Station H., STC Guildford Leagues Club H., Champs Cafe H., MVRC Pacom H., WATC Turf Bowlers H., 3d VRC Sires' Produce S., Gr.1, MRC Blue Diamond Preview (c&g), Gr.3, STC Heritage S., L, Qld Tatt's RC QRSE IPG Print H., AJC Turner Freeman Gough Whitlam H., 4th MRC Blue Diamond Prelude (c&g), Gr.3. Yellow Diamond (Commands). 7 wins to 1400m, HK$6,789,700, HKJC Jockey Club Community Trophy, Duddell H., Happy Valley Vase H., Amber H., Mr Vitality H., Industrialist H., Sinolink Real Estate Number Two H., 2d HKJC Centenary Sprint Cup, L, Yan Oi Tong Cup, Happy Valley Trophy H., 3d HKJC Chow Tai Fook Bauhinia Sprint Trophy, L, Chevalier Cup, Cornwall H., Fan Kam H., 4th HKJC Sha Tin Sprint Trophy, L, Premier Bowl H., L.
Chasse (Octagonal). 5 wins from 1200m to 2000m, A$349,235, VRC Spotless H., MRC BTB Australia Directional Drilling H., Shadwell Estate Co UK H., 2d MRC Sandown Guineas, Gr.2, VRC National Jockeys Trust H., MVRC Gillies Famous Pies H., VRC SES Victorian Volunteers H., Festival of Racing H., 3d VRC Hiraji H., Bruce Gadsden H., Mittys H., MRC Betfair H., 4th ATC South Pacific H., L, Hawkesbury Guineas, L.
Sway to Go. 5 wins at 1100m, 1200m, A$149,830, BRC Blackwoods H., Austcover H., Patinack Farm H., Hardy Brothers Jewellers H., STC Freeway Republic Beer H., 2d AJC Coronation Day H., Royalrandwick.com H., BRC David Jones H., BOQ H., Simon George & Sons P., CNW Proudly Australian H., 3d BRC Metricon Homes De Blancs H., Act for Kids H., Replica Trophies at Winningedge.net.au H.